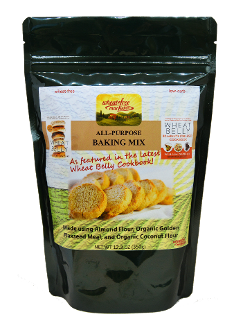 This blend is based on the Wheat Belly All-Purpose Baking Mix. A real time-saver! Used in many baking applications in the new Wheat Belly 30 Minute (Or Less!) Cookbook. One ounce has just 2 net carbs. Ingredients: Almond Flour, Organic Golden Flaxseed Meal, Organic Coconut Flour, Baking Soda, and Psyllium Husk Powder. For many exciting recipes, check out the Recipes tab at wheatfreemarket.com ! !